If you’re on your Mac throughout the day, it can be tedious to switch between hidden windows and applications, or to quickly open programs not in the Dock. Among the solutions for switching between applications, Switchem is one of the newest options. 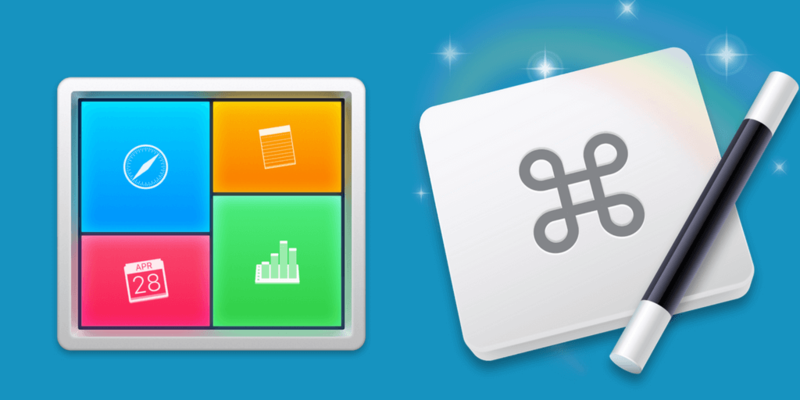 In a previous article I compared Apple’s application switcher with Keyboard Maestro’s Application switcher action, as well as the benefits of using SuperTab, a multi-dock application useful for accessing applications not in your regular Dock. However, Switchem might be a useful solution for a few reasons: It allows you to open multiple preselected app windows and files at the same time, and to have those windows appear in the same size and position as you set them up. What Switchem does, can also be accomplished using Keyboard Maestro, BetterTouchTool or perhaps even with Alfred’s workflow feature. However, some people may find Switchem easier to use for this setup than with automation applications. When you work at your Mac, you probably often open multiple applications and/or web pages at a time to work on a particular project or area of focus. 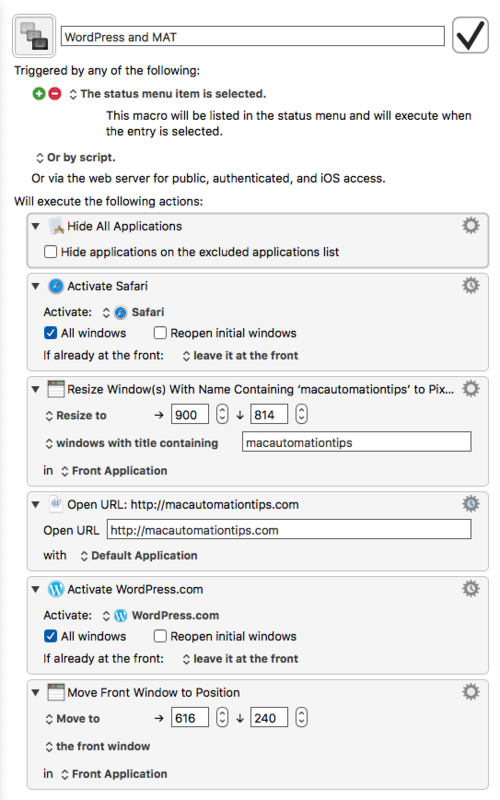 For instance, to write this article, I typically open three items: the WordPress.com application to draft my article, my MacAutomationTips blog to reference past articles, and the ScreenFloat browser to access screenshots I’ve taken to include in this article. Before I begin writing and working on an article, I could use Switchem to open the above items to save the trouble of opening them individually. 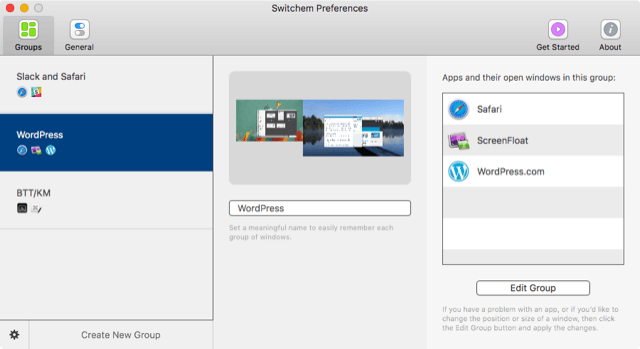 I can simply trigger these items using my assigned Switchem keyboard shortcut to open the Group Switcher, or I can access the switcher from the menu bar. If you use Keyboard Maestro, you could easily create a macro to open and place applications and windows where you set them up to display (see an example at the end of this article.) However, the Switchem setup might be a little faster because it simply records where you placed your open windows. Open and place the application windows exactly where you want them. Click on the Switchem icon in the menu bar, and then click the Create New Group button. Check the windows/applications that you want to include in your group, and click Create New Group. 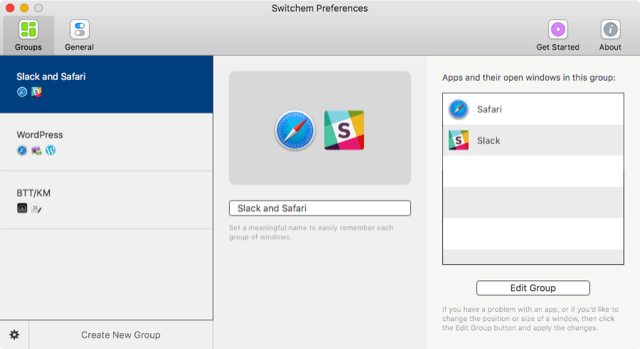 In the Switchem preferences, give your new group a name, and you’re set. To edit a group, click on the Edit Group button, reposition and/or add more windows, and save the group. If you want to hide or remove a group, click on the gear button on the bottom-right. 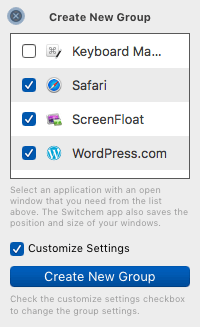 To trigger the Switchem switcher window, you can either use your assigned keyboard shortcut or you can access and trigger the switcher in the menu bar. When the switcher opens, you select a group by clicking on it, typing its assigned number while holding down the Option+Shift keys, or by using your right or left Arrow keys to navigate between windows and hitting the Return key. 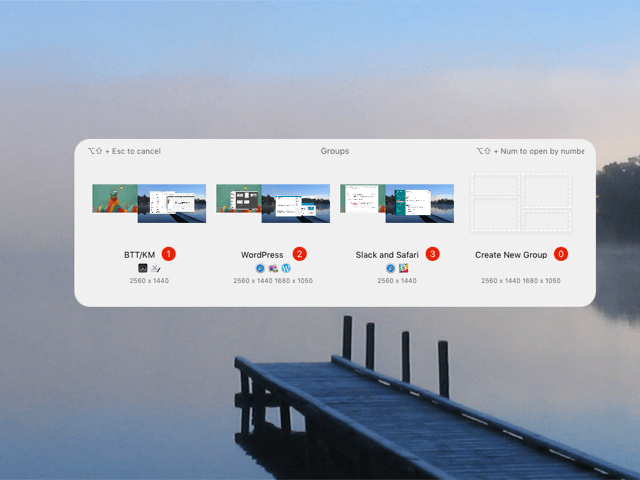 In the course of writing this article, a 1.1.0 update arrived, and among the notable changes is that the Groups window now displays preselected application icons, instead of a screenshot of how you arranged the selected windows on your desktop(s). This change, the developers say, is based on many requests and suggestions, but personally I prefer the screenshot display. The update also includes the ability to add a file for a selected group in order to open one with the group. If you trigger the Group window using your assigned keyboard shortcut, it appears that the last activated group will automatically be selected. However, if you don’t select another group to open, the preselected group will open if you don’t click Esc key to close the window. If I use Switchem on a regular basis, I will definitely trigger it by using a BetterTouchTool finger gesture, or I will simply click it from the menu bar. The Switchem Groups window could also be triggered using a Keyboard Maestro string trigger so that you can keep your hands on your keys while you trigger a group. But I doubt I would trigger a group while my hand is on the keyboard because Switchem is mainly geared to opening pre-selected groups of windows, unlike with Apple or Keyboard Maestro’s application switcher in which you switch from one application to another. 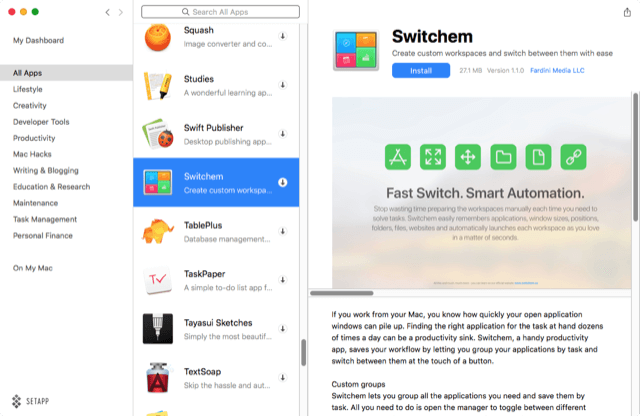 You can download a trial version of Switchem, and the paid version is $9.99. I’m not sure yet how much Switchem will become a part of my daily workflow, but there a few improvements I would like to suggest. Most importantly it would useful if Switchem provided an option to automatically hide all opened windows before it opened a selected group of windows. So if your desktop is cluttered, you can have it cleared and replaced with the group of positioned windows. It would also be useful to arrange the order in which a group of windows are opened. 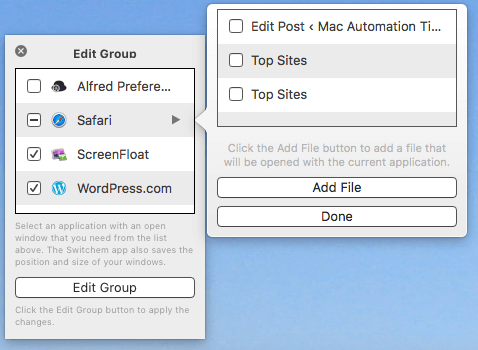 In my test, I positioned the Safari window behind the WordPress.com application window, but when I trigger the group, the Safari window appears in the front of the application. Perhaps if I play around with the order of the windows I could get it to work the way I want, but it would be easier to reorder the windows in the editor. If you’re a Keyboard Maestro user, you can create a macro that arranges selected windows in the size and order you want, and you trigger the macro using a keyboard shortcut, from a macro palette, or from within the Keyboard Maestro status menu. Below is an example of how the macro might be set up. Notice how the macro includes an action to hide all existing windows before it opens the preset windows. You could set up a macro palette to include several individual window groupings to trigger when needed. You may be wondering, when it comes to opening application windows, how useful is it to be able to open groups of windows at the same time? Well, I think that depends the type of work you do on your Mac. Personally I think automating tasks is simply a more efficient way of getting things done, and when I save a clicks and steps to accomplish a routine task, then applications like Switchem and Keyboard Maestro are helpful in my workflow. Let me know what you think about Switchem and if you plan to use it, or to use Keyboard Maestro for a similar purpose. You don’t have to provide a credit card to register for Setapp. 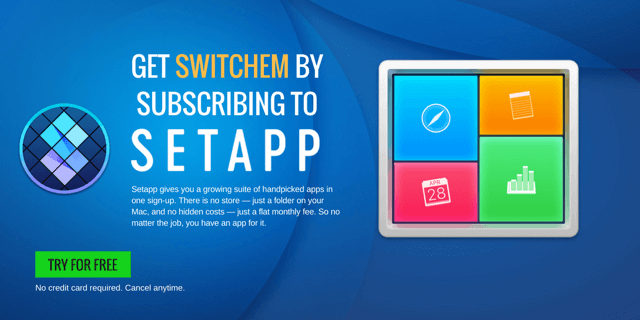 At the end of your month trial, you can sign up for a $9.99 subscription, which gives you access to Switchem and all the applications in the suite. More applications get added to Setapp on a regular basis. Here’s my longer review of Setapp. Let me know what you think of Setapp and Switchem. This seems like an extremely helpful tool. Although I am not a Mac user, this would definitely be something I would look into if I was. Thanks for the instructional post and visuals, very helpful in seeing what needs to be done to work the applications properly. I really like the app, but I’m finding that it doesn’t recognize some of my open applications, so I can’t assign them to groups. So far, Switchem won’t cooperate with my installations of AirMail3, Photoshop CS6 and InDesign CS6. I wrote the developer, so we’ll see. Hey Ben, thanks for letting us know this. Let us know if it gets fixed.